Have you ever noticed how the same recipe prepared by different people appears totally different and yet the basic ingredients used are the same. The way my mum use to make handvo and the way I make it appears different. The way my mother in law makes so many dishes, appears different when I make it. Everyone has a special magic in their hands when it comes to cooking, it acquires your trait. Wanting to make gobi (cauliflower) in a different manner to the usual ways I make it, I had bookmarked Shweta’s recipe for kadhai gobi. The first time I made it, somehow the yogurt just got separated from the cauliflower and the little gravy appeared watery. The second time I made it, hubby dear insisted that the sabji (vegetable) should have a bit more gravy.Third try and added more yogurt. Remembering what had happened during my first attempt, decided to add some moong flour to hold the gravy and cauliflower together. Yum was the result but it didn’t look anything like what Shweta had made. But since the whole idea of making this sabji came about by following her recipe, the credit does go to her. As you will notice there is more gravy and I have not used red chilli powder. Cut the cauliflower into bite size florets. Wash and drain the water out. Boil about 4 to 5 cups of water. Add 1 tsp of salt. Add the cauliflower and let the water come to a boil again. By then the cauliflower will be half cooked. Add mustard, cumin and sesame seeds to it. Add hing and sliced onions. Stir fry till the onion becomes soft. Add flour and stir fry for a few seconds. Add ginger, garlic and chilli pastes. Add turmeric, coriander powders and garam masala. Stir and add the water. Add cauliflower and the remaining salt. Cover the pan and lower the heat. Cook the sabji till the cauliflower is done. Garnish with chopped coriander and serve with hot rotis or parathas. Don’t over cook the cauliflower otherwise the sabji will become mushy. Adjust spices according to your taste. I once added curry leaves and it tasted good. Can steam the cauliflower if you want to. You can add chana flour. I used moong flour as hubby is allergic to chana. 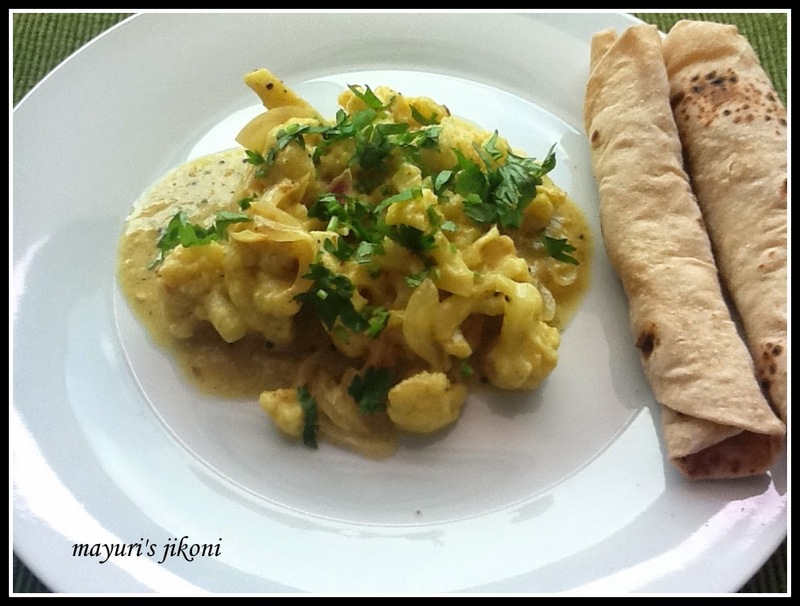 delicious kadhi with cauliflower. love it. Looks delicious! Thanks for linking it to Healthy Diet event! We need variations in the regular food and it's always nice to try other blogger's preparation. Nice curry. Thanks for linking it to ONLY gluten free.